Thailand's Prime Minister Prayuth Chan-ocha speaks to journalists after casting his vote at a polling station in Bangkok. Thailand's ruling junta took an unexpected lead in the country's first election since a 2014 coup with more than 90 percent of ballots counted, election authorities said late Sunday, putting it on course to return to power at the expense of the kingdom's pro-democracy camp. The Phalang Pracharat party, which wants junta chief Prayut Chan-O-Cha to return as premier, gained more than 7.3 million votes with 91 per cent of votes tallied, according to the EC - almost half a million more than Pheu Thai. "People want to vote", said businesswoman Apiyada Svarachorn at a Bangkok polling station, adding the public remains "split into two sides". The formation of a new government, likely to be unstable and short-lived, could take weeks of haggling. The upstart Future Forward party, a fierce critic of the military government, is surging with 4.31 million votes. Of the 93% of unofficial poll results announced by the Election Commission (EC), Pheu Thai won the most seats in the constituency system with 125 while the PPRP came in second on 97, followed by the Bhumjaithai Party (39), the Democrat Party (29) and the Future Forward Party (26) as of press time. "I resign from my leadership of the Democrat Party", said Abhisit, who was prime minister from 2008 to 2011. Another party, Phumjai Thai, which experts say could support the junta, picked up 3.2 million votes. 'It looks unlikely that a sizeable enough anti-junta majority will form in the House to put pressure on the military to back away, ' said Peter Mumford, an analyst at Eurasia Group, which advises worldwide companies on political risks. The initial results from 350 constituency seats contested were posted on the commission's website on Monday. Thailand's benchmark stock index is up 5.3% this year, but foreign investors have dumped shares after last month's surprise, short-lived entry of the king's sister into politics threw the election into turmoil. There is a small but possible chance that the Thaksin-aligned Peu Thai party will be able to nominate its choice of prime minister and form a government if they pull off a landslide victory and gain over 376 seats in the lower house. Pheu Thai's secretary general, Phumtham Wechayachai, said the party was waiting for official results but believes there were irregularities. This same ballot would be used to determine a separate list of allocated seats to each party. The Election Commission report even paused for a while. "We are pleased with the results so far", said Phalang Pracharat leader Uttama Savanayana. 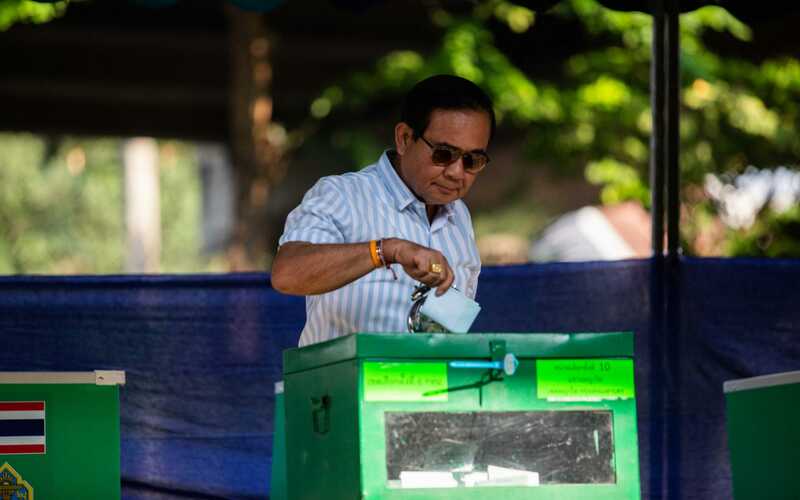 Leaders of political parties opposed to military rule urged a high turnout as the only way to derail Prayuth's plans, but the 66 percent turnout fell short of their hopes. "What is now interesting is how Palang Pracharat can bring together a coalition", said Kevin Hewison, a Thai politics expert who is a University of North Carolina emeritus professor. Of course, we may also see protests by people unhappy with the rigging of the election by the people. The hashtag appeared to be a response to an unusual statement from Thai King Vajiralongkorn ahead of the vote, in which he encouraged voters to pick "good people" as their leaders and stop "bad people" from obtaining power and causing turmoil.